When I sat down to write THE STOLEN, the third Henry Parker novel, at first I was somewhat lost. I had a very specific idea in mind for what kind of book I wanted THE MARK to be, and the idea for THE GUILTY came to me while I was still penning the first book. The ideas for my first two books were in my head early. THE STOLEN was the first book I had to write totally from scratch, without a sense of what I wanted it to be. I wanted it to be different from the first two--in some ways more chilling than thrilling--but I needed a story that would accomplish that without deviating too much from the tone and pace I'd set in the first two books. Then an image came to mind. I can't remember exactly where I saw it, but I read a recent story about Elizabeth Smart, the young girl kidnapped by polygamists and held against her will for nine months while the nation prayed for her safety. I read about her parents, her community, how it affected everyone around her, including us. For some reason, that crime planted the seed for my story. And it grew, and one image popped into my head. Picture a family at the dinner table. They're eating, talking, passing the food. The kids are acting up, mommy scolding them. It feels like a normal family, but there's an air of sadness about them. Then the doorbell rings. When the mother goes to answer it, her jaw drops. She begins to cry. Standing outside the front door is her young son who disappeared years ago, vanishing without a trace. She gathers him into her arms, tears falling freely, embracing the child she thought she'd lost. The boy hugs her back. Only he's not sure why. Because even though he's been gone, he has no memory of where he's been. That's where my story would begin. This would raise several questions: How was the boy taken? How could he not remember the last few years? And what would it be like to suddenly be five years older, the world having grown while you did not? Henry Parker is a young man, estranged from his parents. In many ways, Henry has chosen to forget years of his childhood. When he begins looking into the disappearance of this boy, I thought it was a beautiful symmetry: a young man who never really was a child, trying to find out the truth about a boy whose childhood was taken from him. As much as I want my Parker novels to be page-turners, gripping crime novels, I want the readers to feel engaged with the characters even more so. Anyone can fire a gun. Anyone can investigate a crime. But the reader won't care unless they feel an attachment to the person doing it. I want each book to be somewhat of a personal quest for Henry, and in each book I want the reader to learn a little more about him. So when the mother sees her young son on that porch, a boy who has literally and figuratively been lost for years, in my mind I saw two people standing there. 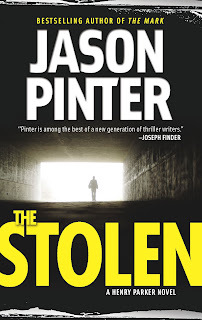 THE STOLEN: In stores today! Five years ago the young boy disappeared from his suburban home. Today the third Henry Parker novel officially goes on sale in bookstores across the U.S. I think the is the most chilling, and perhaps the best paced Parker novel yet, and I'm very eager to hear what reader think. As in each of my books, there was one central image that inspired this book. And that was the picture of a mother answering her doorbell, opening it to see her child who'd vanished without a trace five years ago. This was the kind of image that chilled me, and I hope it does the same for readers. Click here to read an excerpt of THE STOLEN. Check out my list of upcoming appearances. Want to be thanked in the acknowledgments section of a 2009 Henry Parker novel? By spreading the word about this free book you can do just that. Click here (and scroll down) to find out how. Last night was the first signing for THE STOLEN, held at the terrific Open Book. The crowd was enthusiastic, and I set a personal record for most books signed at one event. Thanks to Terry Lucas and her wonderful staff for putting on such a great event. "Pinter is a force to be reckoned with in the thriller world. His plots are smart, his writing is crisp, and Henry Parker is everything a hero should be." THE STOLEN technically goes on sale tomorrow, but it has been popping up in stores. If you read it let me know what you think at jason@jasonpinter.com. Click here to see upcoming signings and events. And remember to read the first book in the Henry Parker series FOR FREE! Thanks...still 11 free days left! I wanted to thank all the readers who've passed along the offer to read THE MARK for free online. The response has been phenomenal, and I'm already hearing from people who've started reading the book. If you haven't yet, click 'Read THE MARK' below for access to the full, uncut text of the first Henry Parker novel, THE MARK. Quick note: If you've posted a link to the free book, or embedded the widget itself on your blog or website, PLEASE remember to email me at jason@jasonpinter.com. I've seen it on a lot of blogs, but haven't heard from the actual people and I don't want anyone to be left out. 1) Email five friends about this free read (with a link to www.jasonpinter.com or jasonpinter.blogspot.com). Make sure to cc/bcc me at jason@jasonpinter.com on the email. This is only so I can keep track, the emails will not be used for anything nefarious. Thanks for reading and spreading the word. Have a great weekend! Through August 5th, you can read THE MARK online--for free! Click the "Browse this Book" link below to read the novel that's been nominated for the Barry award, the Strand Critics award and the Romantic Times Reviewers Choice award--absolutely free. BONUS: scroll down to see how you can personally be thanked in a future Henry Parker novel! Right as I’m about to die, I realize all the myths are fake. There’s no white light at the end of the tunnel. My life isn’t flashing before my eyes. All I can think about is how much I want to live. I moved to New York City a month ago to become the best journalist the world had ever seen. To find the greatest stories never told. And now here I am–Henry Parker, twenty four years old and weary beyond rational thought, a bullet one trigger pull from ending my life. I can’t run. Running is all Amanda and I have done for the past seventy two hours. And I’m tired. Tired of knowing the truth and not being able to tell it. Five minutes ago I thought I had the story all figured out. I knew that both of these men–one an FBI agent, the other an assassin–wanted me dead, but for very different reasons. If I die tonight–more people will die tomorrow. Spread the word and be thanked for your efforts! I want as many people as possible to read THE MARK for free. And I want readers to know how much I appreciate their efforts. 1) Email five friends about this free read (with a link to www.jasonpinter.com or jasonpinter.blogspot.com). Make sure to cc/bcc me at jason@jasonpinter.com on the email (this is only so I can keep track, the emails will not be used for anything nefarious). 2) Link to www.jasonpinter.com or embed the "Browse the Book" widget on your blog or website. Click the 'Add to your site' link on the widget for the html code. Then see your name in the acknowledgments page of a 2009 Henry Parker novel. Please pass this along to friends, family, and anyone you know who's looking for a good summer read. And I sincerely hope you enjoy the first Henry Parker novel. P.S. A very sincere thanks to my publisher for making this happen. Starting tomorrow, there will be a very special announcement (it might begin at midnight tonight if I can figure it out in time). It will only be up for a limited time, and there will be prizes to be won (yay!). --Send me an email at jason@jasonpinter.com and and I'll add you to the mailing list. So how was the movie? In one word...wow. This was an epic film on every level, taking the seeds planted in "Batman Begins" and expanding and improving on every possible level. The performances are better. The fight scenes and effects are better. The story is better. I literally felt giddy the entire two and a half hours we sat in that theater, leaving thinking the film could have easily gone on another half hour. "The Dark Knight" presents a superhero movie that exists within our own world. Batman has limits, and it is established early on that being Batman is taking its toll on Bruce Wayne. The stunts he performs are only possible with the help of technology. Like in the comics, Batman is merely an ordinary man wearing a cape. He cannot swing across webs, he cannot absorb knives and gunfire without being wounded, he cannot leap from tall building and make miraculous landings without a scratch. This creates a tension not present in, really, any superhero movie, since one wrong step and Bruce Wayne/Batman is done for. --Christian Bale owns this role, and is really the anchor of this movie. His Bruce Wayne is conflicted, weary, yet resourceful and persistent. Batman also begins to use his actual detective skills, complementing his brawn with brains. But more importantly, we know immediately that unlike other superheroes, Bruce Wayne is the character's alter-ego. The man's true self only emerges when donning the cowl. --The story is as much a multi-layered crime drama as a superhero story. And it works, beautifully. --The script is much, much tighter. It is "The Departed" in Gotham City. No less tense, often more thrilling, and much, much scarier. --The supporting characters matter. Everyone has their piece in this puzzle, and every character plays a part in developing the story. Gary Oldman and Michael Caine have more to do. Even Eric Roberts (it wasn't so long ago he was eaten by cannibals on an episode of South Park) does a terrific job as Salvatore Moroni, heir to the vacated mafia throne. --Maggie Gyllenhaal is light years better than Katie Holmes. Her Rachel Dawes is not merely a message from the casting director ("Make her cute but tough"), Gyllenhaal makes Rachel a real person we care about. --I've always been unsure of Aaron Eckhart. He seems to me like an actor who's not gifted with enormous talent, but he's someone who feels like he's always giving a role his absolute all. Unlike many with similar gifts, Eckhart is more an actor than celebrity. This is a big compliment. As Harvey Dent, Eckhart gives the performance of his career, portraying Dent as a man who knows he's Gotham's potential savior, and isn't sure whether to embrace it, loathe it, or just go along for the ride. And what happens to the character (come on, you know) is all the more tragic because of what he represents. --Christopher Nolan has improved as a director by leaps and bounds, and he was already damn good to start. The action is crisper (no more battle scenes that feel like you're watching the Tasmanian Devil fight from inside the whirlwind), the acting scenes more on the money, the emotion and stakes much, much higher. There are at least four or five scenes in this movie that gave me chills, and surprisingly only about half of them were action. This movie is firing on all cylinders, both on the superhero and human levels. --The Joker. Ah, The Joker. Walking out of this movie makes Heath Ledger's death even more tragic, because he's truly created one of the iconic characters in film history. Ledger's Joker is completely sadistic, masochistic, unpredictable, hilarious, and brutal. When he dares Batman to kill him, they aren't just words; he's really daring Batman to kill him. He is an agent of chaos in every way, and that he exists on the other side of a very thin line from Batman makes his existence all the more poignant. He literally terrorizes this film like nothing I've seen. Every time we think the Joker is finally cornered, he shows just how ahead of the game he is and how he's been playing us for fools all along. He turns mayhem into poetry. The Joker would not exist without Batman (you almost get the feeling that he was waiting in the shadows for for Batman to appear, as the caped crusader gives his life meaning). Ledger gives a performance that works, like Johnny Depp's in the "Pirates of the Caribbean," because it's all about nuance. The way his body moves, the inflections of his voice, eye ticks and quirks. It's all in the little things, how he can go from amusement to rage in less time than it takes for him to grab a pencil and...you'll have to see the movie. If Javier Bardem can win an Oscar for a relatively one-note performance as a bad guy, Ledger's Joker should be given his own wing. Mainly so he could then melt the statue and laugh while the the wing burns down. "The Dark Knight" is easily one of the two best films of the year so far, and if some washed-out, self-important period drama gets nominated over this film it'll just reinforce how out of touch Hollywood is. I cannot imagine how difficult it must have been to take such a massive canvas with so many working pieces, and have them all work in total precision. Two of the five Best Picture nominees have already been released: "The Dark Knight" and "Wall-E." If you see them back to back you might explode (like hot metal being exposed to freezing cold), but you'll also see the best popular entertainment produced in the last decade. I reviewed Alan Moore and Brian Bolland's THE KILLING JOKE over at Writers are Readers. THE KILLING JOKE is one of the most influential Batman comics ever, and especially relevant because it was the first time we learned how Batman's arch nemesis, The Joker, came to be. It's also the one book Christopher Nolan gave to Heath Ledger to prepare him for his portrayal. And with "The Dark Knight" opening this weekend, what better time to reflect on The Clown Price of Crime. That remains to be seen, but with the publication of my third Henry Parker novel, THE STOLEN, just (gack!) 13 days away, I will be posting on a more regular basis. My month+ long hiatus (during which I still wrote three posts, sigh) was motivated by several factors, not the least of which was that my next novel was due and I needed to devote every extra word to the manuscript. Now that the book is in production, I have a little breathing room. I'm already at work on the next, next Henry Parker novel (which has an opening scene that literally gave me the shivers writing). And I've had an idea for a YA series rattling around for a while that I'm hoping to start fleshing out. I will have two books coming out again in 2009, and I'm VERY excited for these, for reasons that it's probably too early to discuss. Suffice it to say readers will learn much more about Henry's past, as he'll be forced to confront some demons that never really died. But back to the present. I'm very eager to hear the reaction to THE STOLEN. Whereas my first two books likely fell into the "thrillers with elements of mystery" camp, THE STOLEN is more "mystery with elements of thriller." You might say Potato, Potatoe, but it did feel like the book had a different tone while I was writing it. I think it's the most tightly-paced of my books, and there is definitely a real life theme that runs parallel to the story that I hope readers pick up on. 1. The debut author class of 2007 is now a group of cagey veterans, savvy about the publishing process, with none of the concerns or neuroses commonly associated with writers (ok, that might not be true). 2. Thriller writers get some pretty wretched Amazon reviews. And to the person who wanted to "un-read" Lee Child's PERSUADER (my favorite Reacher novel, actually), allow me to offer a giant raspberry for your troubles. 3. Barry Eisler's hair still rocks. 4. I'm still looking for the one truly horrific debut author road story, like being kidnapped by a tribe of cannibals or something. 5. My publisher seems to only release books from authors who are incredibly nice, almost scarily so. Shout outs to Thrillerfest attendees Carla Neggers, Rick Mofina, J.T. Ellison (and hubby), Laura Caldwell, Heather Graham, Kat Martin and Michelle Gagnon. 6. My publisher only seems to publish authors who are much better dressers than I am. Thanks a lot, guys. Can't you find good writer who's also a hobo? 7. Jonathan Maberry's PATIENT ZERO is going to flat out blow people away. Put it on your "Must Read" list for 2009. 8. James Rollins has officially been tapped to replace Jay Leno. I don't think I'm going out on a limb by saying he could be the best emcee in crime writer history (if only that Al Roker wasn't such a potty mouth). 9. My fanboy geek moment of the conference? Riding alone in an elevator with Robert Crais. I think my exact words were "bhalehanfnbsha askdhad ebudbndii." 12. For some reason, I'm very photogenic in Ireland. Special thanks to Pat Mullan who really made my Thrillerfest by bringing the piece in Ireland's Sunday Business Post on me all the way from Dublin. 13. Thriller writers love jokes about the New York Times bestseller list. I believe lawyers also love jokes about depositions. 14. It's really tacky to set up a gigantic easel featuring your book poster at a panel with five other people. 15. Don't know what to do with your extra galleys that are taking up too much space in your apartment? Put them on the freebie table!!! 16. Lots of publishers are kicking themselves over not offering more money for Stephenie Meyer's first novel. 17. The plus side of buying two banquet passes yet going solo: extra drink tickets! 18. You could make a down payment on a beach home for the same price of a beer at the Grand Hyatt. 19. There are rumblings about a second Killer Year anthology (wait, that might be my stomach). 20. People will do anything (have a wedding anniversary, undergo dental surgery) to forgo accepting their Thriller award. 21. David Baldacci has singlehandedly done more to combat illiteracy in this country than pretty much anybody. What he's done cannot be praised enough. Visit the Wish You Well Foundation website to find out more. 22. Nicholas Pekearo was a talented writer and a hero, and his loss is one for all of us. 23. Sandra Brown proves that great success does not have to come at the expense of humor and humility. 24. The judges for "Best Novel" had to read three hundred books in one year. So if you don't see the next Joseph Finder novel until 2013, that's why. 25. Once again, crime writers are the most generous, supportive and fun bunch of folks on the planet. Congrats to all the deserving winners, Robert Harris, Tom Piccirilli and Joe Hill, as well as the nominees. See you in NYC in 2009. Next year, BYOB. When I go to the gym or go for a jog, I tend to listen to loud, angry music. Metallica, Motorhead, Nine Inch Nails. Songs that get my blood pumping, give me an extra charge. Last weekend, I saw Wall-E, the new Pixar movie. I've loved every Pixar film, and was excited for this new one despite knowing little about it. I saw it with my wife and my sister, and as my sister said before the film started she really didn't know much about it. The previews didn't say much. All we knew was that it was about a lonely little robot who has an adventure in space. But since it was Pixar, I didn't need to be convinced. The morning after I saw "Wall-E," I went for a jog. Yet when I went through my iPod to my playlist, I realized I couldn't listen to any of the angry songs that typically played over my workouts. Not that day. All the anger and negative emotion was gone. Wall-E, this simple movie starring this simple little robot, was one of the most touching, emotional, and wondrous pieces of art I've ever experienced. I couldn't listen to angry music that day. If you have not seen the movie, please do yourself a favor and skip all the Hollywood smash-n-bash films this holiday weekend and go see it. Actually, this summer has been pretty good for action. "Iron Man" was fantastic. "Hulk" was better than I expected. And "The Dark Knight" is being called the "Godfather Part 2" of comic book films. But "Wall-E" transcends film. I left the theater feeling overwhelmed. The lump that rose in my throat during the end scene has not left in nearly a week. I bought little posable action figures of Wall-E and his love and savior, Eve. I have not bought a toy in almost twenty years. It is a film that manages to be topical without being preachy, smart without being snarky, funny without being crass, and beautiful despite depicting a world almost devoid of beauty. The love story at the center of "Wall-E" is as simple as they come, yet poetic and devastating and sublime. These two robots broke my heart more than any flesh and blood actors have maybe ever done. This is the kind of movie that makes you want to stop reading about snark and gossip and vitriol, stop spending hours on end staring at screens, because as stated in the song "Put on Your Sunday Clothes" (which plays over the opening credits), there's a whole world out there. It's far easier to destroy than to create. It's easier to tear down than to build up. But as this little robot shows us, the most important things in life are the simplest. And the most incredible things in life aren't things. And if this movie isn't at least nominated for "Best Picture," than the phrase "Best Picture" is completely irrelevant. I'm not recommending this movie. That's something I do for films like "Iron Man." Those are words reserved for good entertainment. As far as I'm concerned, "Wall-E" is a painting, a song. Something that inspires you and stirs up emotions you might have forgotten. Andrew Stanton and the team at Pixar have created something beyond all of their past triumphs, and that's saying something. They've transcended the art of moviemaking, and have made a movie that's truly work of art.